Recently I moved from a hefty gaming PC with nearly 2TB of internal storage to a decidedly faster Macbook pro with a meagre 256gb of PCI-e solid state storage. The move was partly inspired by mobility – arguably the råson d’être of notebook computers in the first place. Resigned to the fact that my notebook was not the place for bulk storage, I also decided that attaching and removing myriad USB / thunderbolt peripherals was not the way to go. 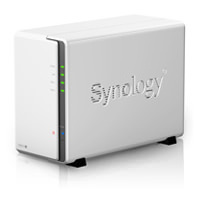 Looking for a NAS which would replace my existing energy hungry file server and provide a greater level of cross-platform integration I decided upon the Synology Diskstation. My experience with the diskstation has been largely positive thus far. While the DS213J does not feature hot-swappable drive rails like the higher-end Synology models, installation was a snap and only took around five minutes. Once the physical drives were installed the NAS was powered on and set up via the web interface. I cannot overstate how well implemented the DSM (Disk Station Manager) operating system is. From the initial setup of the volumes to configuration of file shares, download utilities, VPN server and iTunes server took around an hour and no instructions were required. The web interface is fluid, fast and highly intuitive. A few clicks enabled AFS sharing which allowed my mac to access all folders natively, while the same folders are accessed from Windows devices over samba. The Apple native file format carries the advantage of allowing my time machine backups to be automatically sent to the NAS while on AC power – a serious benefit to any mac user. As any activated sharing protocol is automatically applied to all shares, any newly created shares are available both via samba and AFS – cutting down on admin time. The built in iTunes server allowed me to relocate my music library to the NAS, eliminating another storage-heavy file type from my machine. The same was done for my iPhoto library. The missing piece of this puzzle is VPN. Having my images and music located at home would be quite bothersome were I to need access from elsewhere. The synology VPN Server was also a snap to set up and even included their own dynamic DNS service – QuickConnect. Thanks to the VPN feature, when I need access to iPhoto or iTunes content, I can simply dial the VPN via the OS X native VPN support and the files are accessible as normal. Not only has the DiskStation made my life easier, but also my living room is considerably quieter. The previous file server was an old dual core pentium, which frequently ramped up to full fan speed when carrying out demanding tasks or pushing heavy IO. Thankfully the disk station is whisper quiet and is never noticed. This entry was posted in Apple Mac, Computing, Network, Technology and tagged NAS, Server, Storage. Bookmark the permalink.